The Atlantic has a very thoughtful (and likely controversial) take on youth football. The money in professional football blinds us to the damage young men do to themselves seeking a slice of the pie. Some of the same concerns carry over to youth hockey and basketball, both of which are more violent (and physically damaging) than they were when I was young. Canadian Couch Potato has a very interesting way of showing that diversification works, despite what some say. Andrew Hallam shows that some major RBC actively-managed mutual funds don’t fare well when their 10-year returns are compared to benchmarks. My Own Advisor says you really do need a million dollars to retire well. Million Dollar Journey has the story of a 34-year old who crossed the million-dollar mark. Canadian Capitalist updates his Sleepy Mini Portfolio. Investing can be dead simple. Jeremy Siegel’s book Stocks for the Long Run is in its fifth edition and has so much fascinating information for investors that keeping this review to a reasonable length is a challenge. A major theme running throughout the book is how different stocks look in a long-term view versus a short-term view. Despite Siegel’s deep analysis, this book is very accessible for readers with an interest in investing. 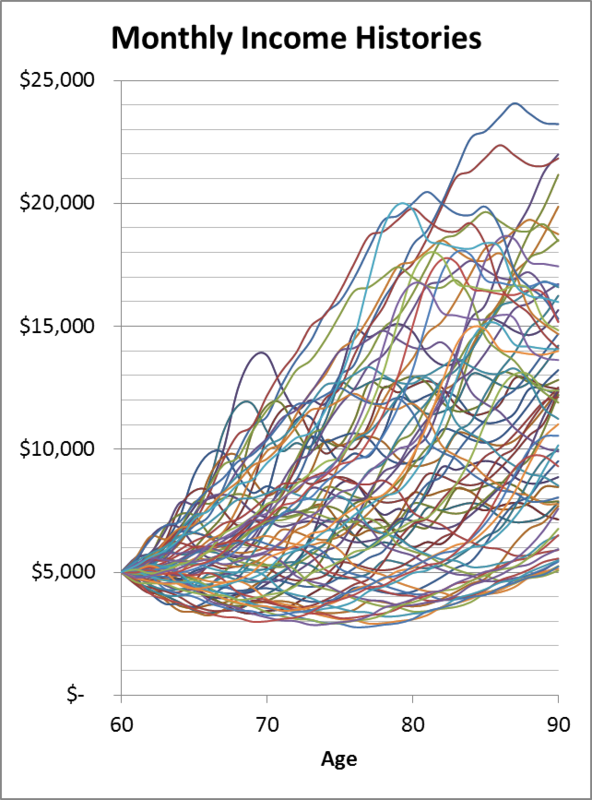 In the Foreword, Peter Bernstein asserts that “stocks must remain ‘the best investment for all those seeking steady, long-term gains’ or our system will come to an end, and with a bang, not a whimper.” Early in the first chapter, Siegel shows a remarkable chart of U.S. asset class returns adjusted for inflation over 210 years. A dollar in stocks grew to over $700,000 from 1802 to 2012 (even after subtracting out inflation). In contrast, bonds grew to only $1800 and gold to a measly $4.52. It’s normal for risks to steady out somewhat over time, but this happens for stocks faster than random chance would predict “because of the mean reversion of equity returns.” In contrast, bond returns steady our more slowly than random chance predicts, which means that bonds show “mean aversion.” So, over long holding periods, stocks offer higher expected returns and lower volatility than bonds, which makes a strong case for owning stocks. For the rest of this review, I’ll discuss some of the many interesting parts of the book. “Some argue that the increased correlation between the world’s stock markets reduces or even eliminates the incentive to diversify one’s portfolio.” However, “correlations are usually calculated over relatively short periods of time,” and long-term correlations are “significantly lower.” If you’re more interested in the state of your portfolio in a couple of decades than next month or next year, geographic diversification looks valuable. How can stocks rise faster than the economy? Some say that the rise of the U.S. to dominate the world is the reason for the impressive history of U.S. stock returns, and that we cannot expect the same in the future for the U.S. or most other countries. In fact, since 1900, U.S. real stock returns have trailed those of Australia and South Africa. There are a total of 12 countries with over a century of real returns over 4% per year, and the world average is over 5% per year. If you don’t care about expected returns and just want to choose an asset allocation between stocks and bonds that minimizes risk, the result depends greatly on the holding period you consider. For 1-year returns, you get the lowest risk with 13% in stocks. However, for 30-year returns you get the lowest risk with 68% stocks. “The traditional way of calculating the P/E of an index or a portfolio is by adding the earnings of each firm in the index and dividing this sum into the total market value of the index.” When some firms report large losses, we can get a “very distorted view of the index’s valuation.” Stock prices can’t go below zero. “Losses in one firm do not cancel the profits of another firm. Equity holders have unique rights to the profits of firms, unsullied by the losses in others.” So, beware of P/E measures of the entire stock market. With charts of stock prices from 1957 to 2012 broken out by quintiles of P/E ratio levels, Siegel shows the existence of a value premium for stocks. However, John Bogle found no evidence for a value premium when looking at returns from 1948 to 2008. Could the slightly different measurement periods be the explanation for the difference of opinion, or is there something else to this? “There is a negative correlation between economic growth and stock returns, and this finding extends not only to those countries in the developed world but also to those in the developing world.” The chart showing poor returns in China is striking. This book has remarkably few typos. One small error occurs in an example of futures markets on page 277 where the figure 1410 should be 1710. This book is very clearly written and offers powerful evidence for the advantages of investing in stocks. I highly recommend it to investors. The Canadian Securities Administrators (CSA) are making changes to reporting rules on client portfolio statements. Among the changes is the requirement to report clients’ yearly returns in dollar-weighted terms (also called the internal rate of return (IRR)). This gives clients a better idea of how their portfolios have performed, but opens the door to the amusing possibility of multiple return values. For an accessible explanation of the difference between time-weighted and dollar-weighted returns, see Neil Jensen’s excellent article. More mathematically-inclined readers can see Wikipedia’s internal rate of return (IRR) page. Dollar-weighted returns are a great idea because they give more weight to the returns you get when you have more money invested. After all, the return you get on a few dollars is much less important than the return you get on millions. However, dollar-weighted returns can have some mathematical quirks in rare circumstances. One of those rare quirks is that there can be more than one correct return value. Start of year portfolio value: $200,000. Mar. 1: Portfolio jumps to $303,000. Client withdraws $300,000. May 1: Client withdraws $2000. July 1: Client withdraws $1000. Nov. 1: Client deposits $301,000. End of year: A poor final two months leaves a portfolio value of $198,000. If you add up the cash flows into and out of the account, you’ll see that a 0% return fits the data. However, a return of 10% every 2 months also fits the data. Even stranger is that a return of -10% every two months fits the data as well! Compounding these returns to a full year, the client statement could show -46.9%, 0%, or +77.2%. No one of these returns is any more correct than the others. On a practical level, this isn’t a big problem. When the return is ambiguous, it means that the cash flows were so unusual that the return isn’t very meaningful anyway. And we could just make up a simple rule about which return to show, or when to show no return at all. Tax rules for RRIFs require you to withdraw a percentage each year that depends on your age. One thought for choosing how much to spend from your entire portfolio in retirement is to use the same table of RRIF percentages. Unfortunately, these percentages are too high and create a serious risk of outliving your money. So, what percentages do make sense? A while back I proposed a possible retirement income strategy where you set aside a fixed number of years of spending somewhere safe (like a high-interest savings account (HISA)) and invest the rest of your savings with the same portfolio allocations you had before retirement. The strategy calls for using your current portfolio balance to choose a spending level. To determine the amount you can spend, you would assume a fixed investment return and calculate the yearly spending level that would deplete the portfolio by some fixed age. Then if your portfolio either gets higher or lower returns than expected, your spending level would increase or decrease. The HISA savings serve to smooth spending levels somewhat. Further smoothing of spending could be done with some filtering. If we just focus on yearly spending amounts rather than trying to adapt monthly, what we end up with is a table of spending percentages similar to the RRIF percentages. I created a spreadsheet to calculate the yearly spending percentages as well as the percentage of savings that would be held in a HISA. To edit this spreadsheet, you need to go to the “File” menu and “Make a copy”. The inputs in the spreadsheet are highlighted in yellow. You need to choose an asset allocation (excluding the HISA) and the expected real return for each asset class. “Real return” means the return after subtracting out inflation. Beware of choosing high returns; the higher they are, the greater the risk of your portfolio returns coming up short and leaving you spending too much early on in retirement. Another very important input is the fees you pay for owning each asset class. I’ve listed 0.12% for stocks because I pay 0.11% in MERs and another 0.01% in commissions and spreads each year. However, few investors have a portfolio with such low costs. Other inputs are the real return of the HISA, number of years of spending saved in the HISA, your target life expectancy, and your minimum expected remaining life. This last input only starts to affect spending levels late in life. If your target life expectancy is 100, but set the minimum remaining life to 10 years, then spending percentages will stop rising at age 90 in an effort to preserve capital. The results appear down the left side of the spreadsheet. It shows, for each age, what percentage of the total savings should be in the HISA, and what percentage of the total savings (including the HISA) you can spend each year. Although, the table starts at age 18, the most useful part begins further down the left side at more realistic retirement ages. The idea is that at the start of each year you would shift portfolio assets into the HISA to match the target percentage. Then you’d withdraw the target spending amount from the HISA during the rest of the year. You might want to add some filtering to the spending levels to avoid sudden changes from one year to the next, but such filtering is not included in the spreadsheet. It might seem that this spending strategy has you spending more money later in retirement because the percentages rise with age. The idea is that if your portfolio’s return exactly matches expectations, your total savings will drop (due to your spending) by exactly the right amount to keep your yearly spending the same from one year to the next. If you try to use such a retirement spending strategy, it’s important not to double-dip. If you are spending dividends or interest from your portfolio, that counts as part of the spending allocation for the year. If you are spending forced RRIF withdrawals, the RRIF assets count as part of your portfolio and the withdrawals count as spending. Don’t forget that you may not actually be able to spend all your withdrawals because of income taxes. This retirement spending strategy can be conservative or aggressive depending on the inputs you choose. The default inputs have a 65-year old spending 4.43% of savings during the year. However, if we reduce the target life expectancy from 100 to 85, drop the years of HISA savings to 3, and increase real stock return to 6%, that percentage jumps to 7.37%. If, instead, we extend life expectancy to 110, increase HISA years of savings to 10, and drop real stock returns to 3%, the spending percentage for a 65-year old drops to 3.14%. I can’t tell you what spreadsheet inputs give a good balance between safety and living a decent life in retirement. This will depend on your ability to adjust your lifestyle, your other income streams from CPP, pensions, or annuities, and other factors. As always, you can’t follow anything here blindly; think for yourself. Last week’s post on the financial side of replacing old toilets got a mention in Carrick on Money. Rob Carrick says that more young people are abandoning the cult of home ownership. Boomer and Echo take on the Investment Funds Institute of Canada (IFIC) over mutual fund fees. SquawkFox says that her drive to fill her RRSP has less to do with rational judgement and more to do with fear of cat food. Canadian Capitalist updated his analysis of currency-neutral S&P 500 index funds. As I explained in a past post, I don’t believe that currency hedging truly produces a currency-neutral fund because fluctuations in the U.S. dollar don’t fully carry over to fluctuations in the value of U.S. companies. A so-called currency-neutral S&P 500 fund is actually a peculiar mix of owning large-cap U.S. stocks along with a partial side bet on the Canadian dollar advancing relative to the U.S. dollar. The Blunt Bean Counter discusses property you may not have thought about for your will: reproductive assets such as sperm and ova. Preet Banerjee’s new book Stop Over-Thinking Your Money is now available in dead-tree format as well as a number of digital formats. I think he’s written a great financial book for the masses. Big Cajun Man runs down the RDSP (Registered Disability Savings Plan) offerings at the big banks. My Own Advisor lists his financial goals for 2014. The last one warms my heart: “Do not incur any new debt in the process.” More people need to add this to their list of goals. To start the year I made some random economic predictions that I have no confidence in myself. Let’s see how well I pin the tail on the donkey. Fail. The Bank of Canada target rate stayed at 1% for yet another year. Fail. According to the Teranet - National Bank Composite House Price Index, house prices in Canada rose an average of 3.81%. Success. Libra Investments have a spreadsheet of historical investment returns. 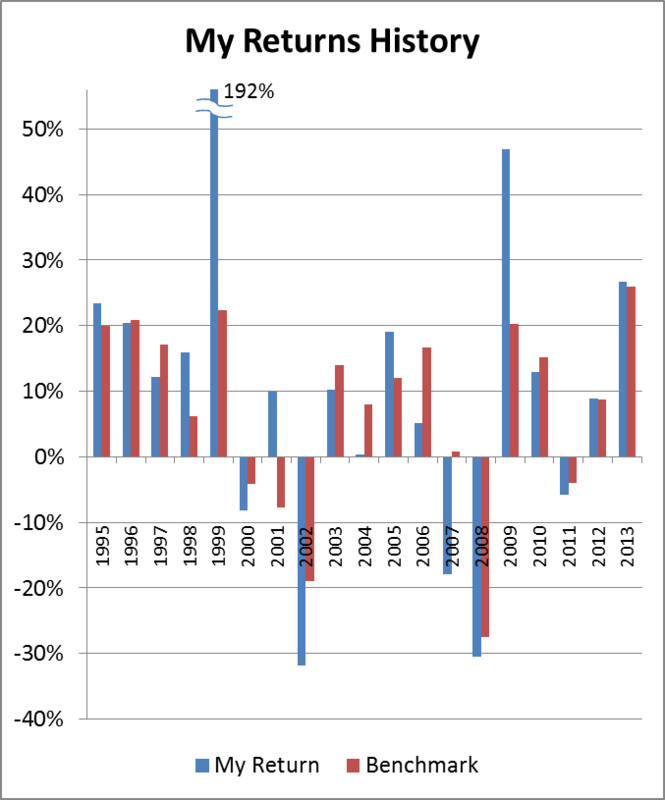 This year’s return of 13% on the TSX composite is above the 10.8% average since 1970. The U.S. S&P 500 was up 29.6% including dividends (measured in U.S. dollars). Success. The Libra Investments spreadsheet says that Canadian bonds dropped 1.2%, clearly a below-average year. 5. The 2013 U.S. government deficit will be less than the 2012 deficit. Success. The U.S. government 2013 deficit was $680 billion, substantially less than $1.1 trillion for 2012. This was known to be a very likely outcome, though. I’ll only take a tiny bit of credit on this one. Success. Berkshire A-class shares went from US$134,060 to US$177,900, an increase of 32.7%, which is higher than the S&P 500’s increase of 32.3%. So, my overall score is a little above middling this year. I made no concentrated bets on these predictions. You shouldn’t have either. With a little luck, I could just as easily have made a bunch of predictions that all turned out to be right. But these would have been just as worthless as the predictions I did make because you can’t know in advance if I’m going to be right or not. If I do get my predictions all right one year, I’d have to find a way to leverage publicity quickly before my next year’s predictions prove to be half wrong. The important lesson here is to avoid paying attention to others’ predictions. It’s normal to be swayed by confident people, but it’s important to remember that their predictions are usually just random. There is a scary scenario that can arise with TFSA over-contributions where you can’t stop tax penalties from building up for an entire year. It involves a situation where your TFSA investments lose money. I’ve hunted through the Income Tax Act for a clause that deals with this case, but found none. The scenario is best explained with a fictitious example. Ted was a big fan of Apple. When TFSAs first came on the scene, he made the maximum $5000 contribution in March of 2009 and put it all in Apple stock. Each January since then (including 2014), he has made a maximum contribution and bought Apple stock. His account now holds C$68,400 worth of stock. Ted’s success with Apple gave him the confidence to try his hand at more active trading. He decided to open a TFSA at a different discount brokerage offering better active trader tools. He then withdrew his money from the first account and deposited it into his new account. At this point, readers knowledgeable about TFSAs will realize that Ted has made a TFSA over-contribution of $68,400. However, Ted didn’t know this. Now he begins picking some stocks and buying shares. For the first few days, he doesn’t trade much, but his pace starts to quicken. He isn’t too bad at picking stocks, but commissions and spreads are eating him alive. By the end of March 2014, some bad luck leaves Ted’s account balance at $8400, a loss of $60,000! Then Ted gets some bad news: he has been carrying a TFSA over-contribution of $68,400 for 3 months. The 1% tax each month will cost Ted $2052. But this is just the beginning of his troubles. Ted immediately withdraws the remaining accounts assets ($8400). However, this still leaves an over-contribution of $60,000. But the account is empty. Ted has no other TFSAs to withdraw from to solve this problem. All he can do is wait for new TFSA contribution room next year to reduce his over-contribution. The remaining 9 months of 2014 cost him 9% of $60,000, or $5400. In January 2015, his over-contribution disappears. The total penalty is $7452. It could be that CRA would use its discretion to waive penalties in such a case. And it could be that discount brokerages have safeguards to prevent people from making such a large over-contribution. But the fact remains that under the TFSA rules as I’ve read them, you can accrue taxes on over-contributions even when your TFSAs are all empty. Support for my Friday Short Takes feature is stronger than I thought. Several people came forward to comment on the blog or send me email asking that I keep it going. And it wasn’t just the various bloggers whose posts I comment on! So, Short Takes live to see another day. Michael Geist explains how internet service providers are boosting revenues by manipulating data caps to create a two-tiered internet that favours certain content. Morgan Housel at the Motley Fool wrote a very funny obituary for long-term thinking. Despite my past annoyance with The Motley Fool, I think Housel’s piece is great. Preet Banerjee interviews Bruce Sellery about his new RRSP book. Sellery is a very energetic guy. Canadian Capitalist explains why he made the jump from TD Direct Investing to BMO InvestorLine. Canadian Couch Potato explains how a falling Canadian dollar affects ETFs of U.S. stocks. Many investors get confused by this. Boomer and Echo explain the right way to think about how your investments are performing. The Blunt Bean Counter is tired of the cold and discusses the business and income tax aspects of golf. Big Cajun Man says now that CPP and EI deductions have begun again, he’s making plans for what to do with the extra income when the deductions stop part-way through the year. My Own Advisor expects to increase his dividend income from $7600 in 2013 to $9000 in 2014. I like to crash stock-picking contests by entering the returns of my personal portfolio. I include all of my stock investments – no cherry-picking. Last year I showed how I had well above-average results in each of 4 years of contests among one group of bloggers. However, this isn’t much of a reflection on me because my portfolio is mostly indexed; it’s the collective results of the other bloggers that was sub-par. A commenter on my post last year (Robb at Boomer and Echo) observed that if I had entered a different 2012 stock-picking contest run by Financial Uproar, I would have come in last place. In fact, the average results were 20.7% ahead of my real-money portfolio. I decided to take a peek again this year to see if they have more magic. For 2013, Financial Uproar’s stock-pickers got an average return of 21.6%. However, my real-money return for 2013 was 26.7%. So, we have a mean reversion of 4.1%1. I’m in fifth place out of 14 entries. This still doesn’t come close to making up for last year’s results, but we’ll see what happens in future years if they keep up with their contest. 1 It might seem that this should be 5.1%, but the right way to compute the compound difference is (1+0.216)/(1+0.267)-1=-4.1%. When Canadians own U.S. assets, they usually think they are exposed to U.S. dollar fluctuations. This is only partly true. Our tendency to think of dollars as an absolute measure of value muddies the water. Let’s choose a very simple fictitious example to help illustrate these ideas. Sandy bought 100 shares of a U.S. stock ETF trading at US$100 per share at the start of a year when the Canadian and U.S. dollars were at parity. So, her investment started out with a value of C$10,000. By the end of the year, the ETF shares rose in value to US$120, and the U.S. dollar finished the year worth C$1.10. Sandy’s 100 shares are now worth US$12,000, or C$13,200. We would normally say that the ETF rose 20%, and Sandy made an extra 10% on the U.S. dollar for a total (compounded) return of 32% when measured in Canadian dollars. Based on this example, it appears that Sandy’s investment had full exposure to the relative value of U.S. and Canadian dollars, but this isn’t the case. Her real exposure is only partial. This becomes clear when we shake off the notion that dollars are an absolute measure of value. We need to look at what happened as the U.S. dollar rose relative to the Canadian dollar. Suppose the reason for this change was that the U.S. dollar rose against most of the world’s currencies. This means that some of the U.S. businesses owned by the ETF saw the value of their foreign revenues drop when measured in U.S. dollars. They also saw the value of some of their foreign assets fall in value. If the U.S. dollar hadn’t dropped, some U.S. businesses would have had higher revenues and asset values when measured in U.S. dollars. This means some of the stock prices would have been higher (again measured in U.S. dollars). So, if the U.S. dollar hadn’t risen, perhaps the ETF return would have been 23% instead of 20%. The net effect of all this is that Sandy’s exposure to the U.S. dollar was only partial. It’s important to remember that when you buy stocks, you own slices of businesses, not dollars. Changes in the value of U.S. dollars do not translate 100% into the same changes in the value of U.S. businesses. This may seem to be the case over the short-term, but over the long-term, businesses have a complex set of exposures to the currencies of the world. This lesson becomes even clearer when we look at an ETF such as VXUS which is bought and sold in U.S. dollars, but holds stocks of non-U.S. companies. It makes little sense to believe that the value of VXUS has a 100% exposure to the U.S. dollar just because it is traded in U.S. dollars. Understanding all this, Canadian Couch Potato’s explanation of how a falling Canadian dollar affects U.S. equity ETFs makes perfect sense. Whether your ETF of U.S. stocks is traded in Canadian or U.S. dollars, what you own is a slice of a set of businesses, and your currency exposure is exactly the same in each case (unless the Canadian version includes currency hedging). If we can’t use dollars as an absolute measure of value, what can we use? The best answer for most Canadians is to use the Consumer Price Index (CPI). This is basically the Canadian dollar adjusted for inflation in the prices of a basket of goods most of us need to buy. For Canadians who spend a lot of time in the U.S., some blend of inflation-adjusted Canadian and U.S. dollars would make sense. I’m reconsidering the usefulness of my Friday short takes. When I have something substantive to say about someone else’s article, I’m thinking of just writing a full article on the subject instead of collecting together several links and a few thoughts. If you have any opinion on this, feel free to comment on this post. I’ll make a decision next week. Preet Banerjee’s new book Stop Over-Thinking Your Money is out, and he interviewed me for his podcast, all in one week! Andrew Hallam has a very interesting hook for getting kids interested in investing. SquawkFox reviews Preet’s new book Stop Over-Thinking Your Money. Potato has had it with Bell and is considering a jump to Primus for a home phone. I’m interested in feedback about customer experience with Primus home phones (regular land line as opposed to VOIP). Canadian Couch Potato is tinkering with his model portfolios. A theme is a shift toward more Vanguard ETFs. All my ETFs are from Vanguard now. But I’m still holding on stubbornly to some shares in Berkshire Hathaway. Canadian Capitalist reports the 2013 asset class returns. Million Dollar Journey lists its most popular articles of 2013. Krystal Yee decided to shift her extra mortgage payments to higher retirement saving. This is a slightly higher risk and higher (expected) reward path. I hope it works out for her. Big Cajun Man suggests working out how much higher your mortgage payment would be if interest rates jumped up, and then try making extra principal payments to match this increase as a stress-test of your finances. It was my pleasure to be a guest on Preet Banerjee’s Mostly Money Mostly Canadian podcast this week. If you’re looking for entertainment value, at one point I managed to connect investing to Charles Barkley. Many thanks to Preet for taking the time to talk to me. A big welcome to those who’ve landed here for the first time after listening to the podcast. (I’m in a good mood; welcome to everyone else too.) Every week I write somewhere between one and five articles on any subject to do with money. I tend to focus on personal finance rather than macroeconomic issues, and I use mathematical analysis to (ironically) simplify things as much as possible. My biggest benefit from writing this blog is interaction with readers. I’m always happy to learn something new about how the financial world works. The best ways to ask a question or speak your mind are to leave a comment on one of my posts (scroll to the bottom of the relevant post) or use Twitter where I’m @MJonMoney. Which Takes a Bigger Bite from Your TFSA: Income Taxes or Mutual Fund Fees? For the record, I discussed the 25-year effect of a 2.5% management expense ratio (what I call the MERQ) during the podcast and said that it would consume more than half your savings. The actual total loss is 46%, not quite half. My estimating abilities failed me. Whether you like to join the conversation or just read a few posts, I’m always happy to have more readers. Welcome. Banerjee has what I call a good sense of scale. He knows which mistakes have a small cost and which have a large cost. If you don’t save, “who cares about the difference in taxation of dividends and capital gains in your portfolio? What portfolio?” With his 5 rules, Banerjee focuses on the actions that give the biggest return. If a financial choice has only a modest impact, he says you should only worry about that if you’re going for your A+. When you’re focusing on your A first, things get much simpler. For the rest of this review, I’ll pick out a few parts of the book I found particularly interesting. Most books that discuss life insurance don’t even mention the critical issue of the time of underwriting; Banerjee leads with it. Mortgage life insurance typically gets underwritten at the time of the claim. That’s a fancy way of saying that they wait until you die to check your mortgage insurance application to see if you qualify for life insurance. What good is life insurance if you don’t know if it will pay? Banerjee recommends that you “have a few hundred dollars (or more) in cash stored in a safe place in your home” to “buy necessities if there is a natural disaster that knocks out the ability to pay ... with debit and credit cards.” That’s one I hadn’t thought about before. “Pretend you lost your job today and you won’t find work again until the end of the year.” Banerjee doesn’t want you to just imagine this scenario; he wants you to live it for a few months. Except for things that are difficult to cut for just a few months, he wants you to try living for a while as though you must cut way back on expenses. Banerjee goes through an example to show that today’s interest rates on savings aren’t much different from what they were in 1980 after you deduct taxes and inflation. This directly contradicts claims by others that savers fared better in the past when interest rates were high. Banerjee believes that most people need financial advice, but not just about their investments. He gives the clearest description I’ve seen of the different models for how funds charge you money and how financial advisors are compensated. His description of the advantage of being able to write off the cost of a fee-based advisor leaves out the added taxes on the higher investment returns. He says he will clarify this point in a future version of the book. Overall, I highly recommend this book as a way to get the message out that running your personal finances well can be simple. People would do well to make sure that they deserve an A based on Banerjee’s rules. Your Unused TFSA and RRSP Contribution Room is Shrinking! Loopholes in the U.S. tax code has allowed the wealthiest Americans to save over $100 billion in gift taxes and estate taxes since the year 2000. These loopholes “make the estate tax system essentially voluntary”. Thanks to the Stingy Investor for pointing me to this one. Canadian Couch Potato reports on another active investment strategy that showed promise initially and then floundered. So often these strategies succumb to reversion to the mean, eventually. And that’s when high investment costs show themselves. Big Cajun Man lists his most read posts from 2013. Million Dollar Journey gives an end-of-year net worth update. Of particular interest to me was Frugal Trader’s reporting of the internal rate of return (IRR) in a couple of his accounts. He did very well on Canadian and U.S. stocks. I’d be interested to see the IRR of his entire investment portfolio. This is something I calculate and publish for my own portfolio each year, but I haven’t seen other bloggers do this. If you thought that meant that the average Canadian CEO earns in about 4 hours what the average worker earns all year, you’re mistaken, but I don’t blame you. In reality, the average CEO pay is 171 times higher, which means that it takes CEOs about a day and a half to earn what the average worker earns in a year. The idea is that the CEO was paid for Jan. 1 as well. I don’t see the point of being unclear about this. CEO pay is extreme enough that there is no need to make it look worse. Perhaps the mention of “January 2” was meant to add some clarity, but it doesn’t help much. Only more mathematically curious readers would figure this out from the pay ratio of 171. I have no problem with CEOs who are genuinely worth the money they are paid. Too often, though, the company’s board of directors aren’t doing their jobs properly. The board is supposed to represent stockholders and negotiate for a good CEO at a reasonable price. This doesn’t work well when the CEO controls the board and gets friends elected to it.